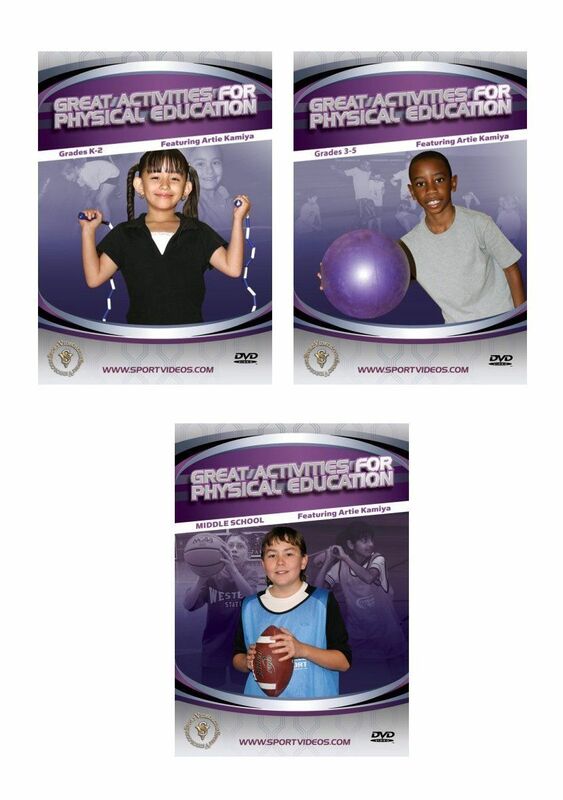 Great Activities for Physical Education: Grades K-2 In this unique program, Artie Kamiya presents several fun physical education activities that promote student fitness and skill development. The download provides numerous developmentally appropriate activities for students in Grades K-2. Teachers will be able to save invaluable planning and preparation time. Games and activities included are: Walking through the Jungle, Let s Go Hunting, I See, The Egg Game, Ninja Turtle Tag, Seals and Sharks, The Birdie Dance and Birdie Dance Tag, The Seven Jumps Dance, Cranes and Crows, Odds and Evens, Jellybean Tag, Octopus Tag, Fish Gobbler and People to People. All of these activities can be easily implemented into any curriculum. 56 minutes. 2007. Great Activities for Physical Education: Grades 3-5 Artie Kamiya introduces a wide variety of new activities that are designed for fitness and skill development for students in grades 3-5! This comprehensive download will help physical education teachers discover innovative ways to keep their students actively involved and having fun. The games and activities included are: Sitting Square Dance, Partner Challenges, Scatter Square Dance, Leader s Change, Line Leader s Change, Cooperative Group Volley, Bowling for Fitness, Crazy Softball, End Ball, Sock-It-To-Me Soccer, I Like People Who, Triangle Tag, Cranes and Crows, Multiplication Tag, Blob Tag and TV Legs Tag. Each game can be easily implemented into any elementary school curriculum. 57 minutes. 2007. Great Activities for Physical Education: Middle School Are you ready to add more enthusiasm and fun to your physical education classes? In this download, Artie Kamiya provides several innovative new games and activities for students in grades 6-8. The games and activities included are: Roller Ball, Which Way Kickball, Hoop Ball, Build-up Ball, High Five Softball, Straight Line Baseball, Decision Ball, Square Ball, Cone Ball, 3-on-3-on-3 Basketball, Mystery Maze, Ultimate Ping Pong, Double Time Kickball, Score Ball, Guard Ball, Ultimate Football, Group Juggling and Basketball Hot Spots. Each game can be easily implemented into any middle school curriculum. 90 minutes. 2008. Artie Kamiya is one of the premier physical education consultants in the United States. He is the former Director of K-12 Physical Education for the State of North Carolina and the founder of the Great Activities Publishing Company. Artie was selected as the 2004 National Physical Education Administrator of the Year by the Council for School Leadership in Physical Education. He has presented over 400 workshops in 40 different states.